Warnings that a crumbling theatre in Chatham is now an unsafe structure have prompted a partial demolition and an emergency road closure in the town. Medway Council said site owners Chatham Housing organised an inspection of the old Theatre Royal building this week. Consulting engineers warned the structure was dangerous and should be made safe as a matter of urgency, a spokesman for the authority said. The council said a partial demolition got under way on Saturday. The work is expected to take four to five weeks, Medway Council added. A statement said: "In the interests of public safety, the council is closing Manor Road, Chatham, tomorrow. "The road will remain closed to through traffic until demolition is completed. There will be restricted pedestrian access." Listed building consent for partial demolition of the Theatre Royal was granted by the council two years ago, it added. 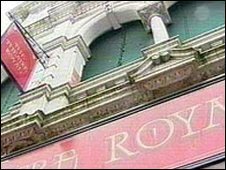 The council said it did not own any of the Theatre Royal site.